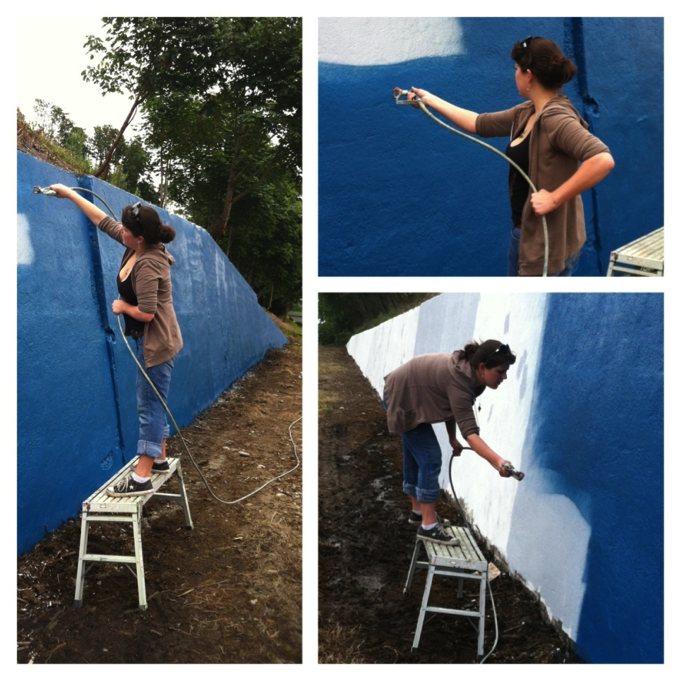 Progress is being made at the Hope Heights mural wall located at 6323 McKinley Ave. on Tacoma’s Eastside. 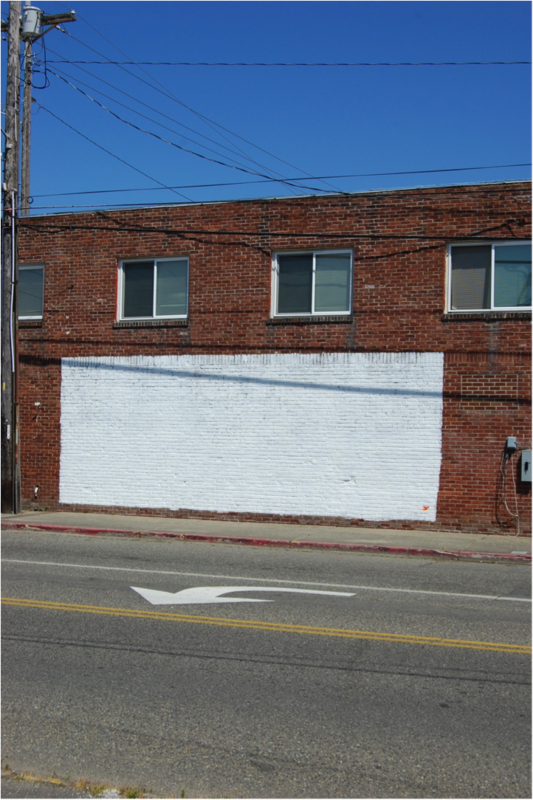 The wall has been cleaned, primed, and prepped—ready for painting to begin! With the help of the community and a team of artists led by Joni Joachims, the Hope Heights mural will be underway shortly! 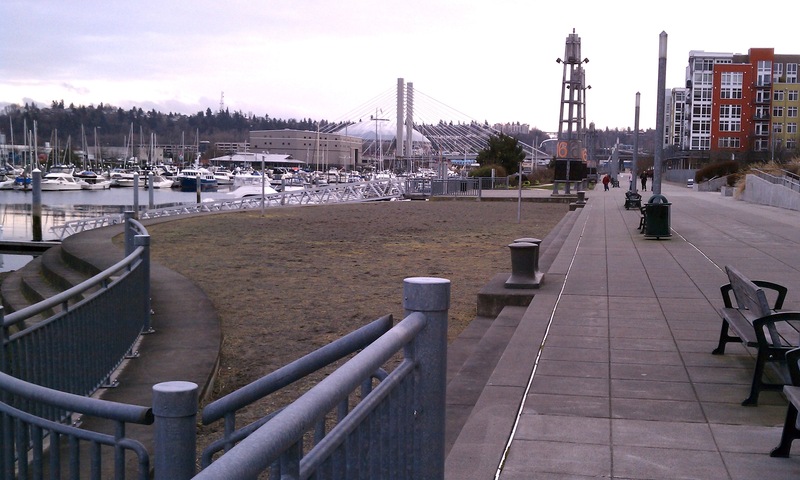 Tacoma just looooves a blank slate! Paul Marioni, a founder of the studio-glass movement donated his 400-piece glass art collection to the Tacoma Art Museum. This collection includes his work, as well as the work of others, and was given to the Museum because of its long commitment to Northwest art. This collections value is estimated at more than $1 million dollars and is an extremely generous donation to the art community. This summer Tacoma Art Museum celebrates the art and legacy of one of the Pacific Northwest’s most innovative and influential artist families: Paul Marioni and his children Dante and Marina, while marking the 50th anniversary of studio art glass in America. 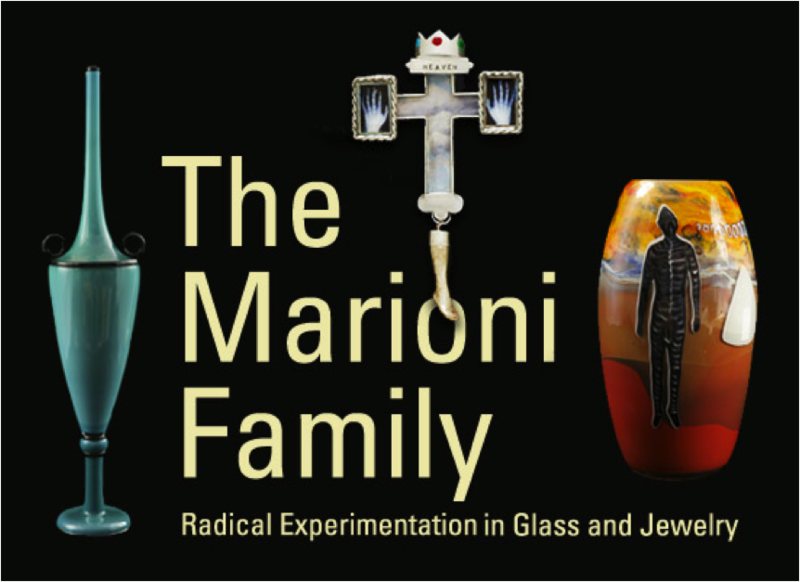 On view June 9 through September 23, The Marioni Family: Radical Experimentation in Glass and Jewelry showcases how the artists of the Marioni family engage with form, materiality, and tradition, each in their own thought-provoking and individual styles. 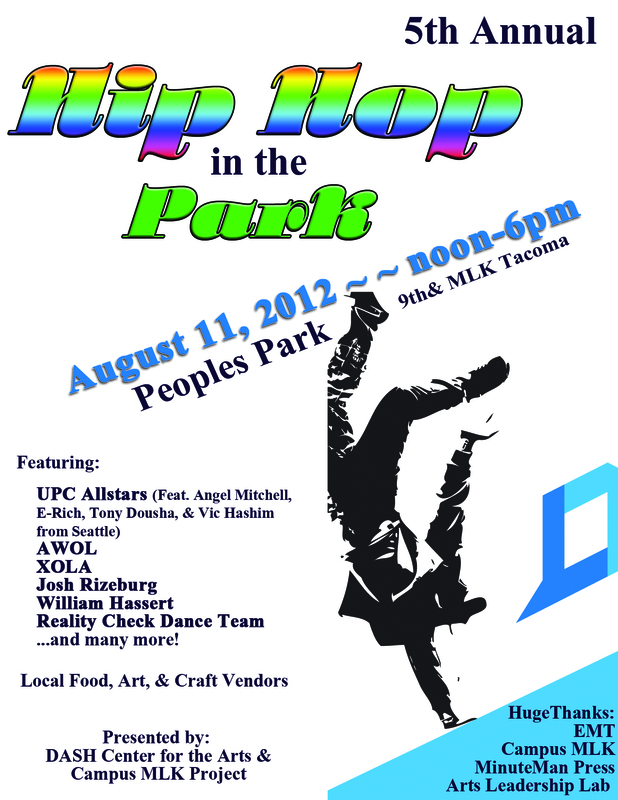 People of all ages will converge at People’s Park on August 11 for the Fifth Annual Hip Hop in the Park event from noon to 6pm. This event, which is organized by the DASH Center for the Arts, is designed to bring the younger and the older community members together in a positive environment. “Hip Hop is a voice of the people both young and old. It’s almost a lost art form. Part of our vision at DASH is to make sure the hip hop culture is not. That’s why each year, we come together to celebrate all that is Hip Hop,” said Candi Hall, DASH Center Executive Director. “This is a family fun event reaching out to its community to show real Hip Hop,” said Darren Spencer, Director of the Art of Hip Hop program at the DASH Center. His students will perform at this end of the year event, showing the community their creative expression. The center is also hoping to recruit new students for next year’s class. 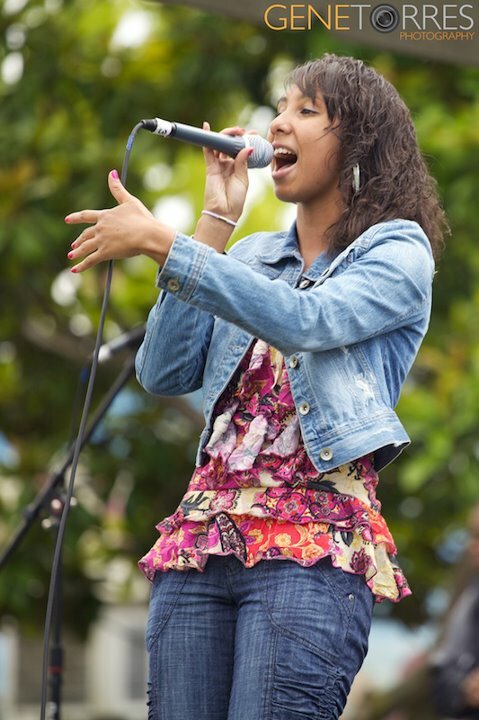 Along with students from the DASH Center, performances will include UPC All Stars featuring Angel Mitchell, E-Rich, Tiny Dousha and Vic Hashim, Josh Rizeberg and AWOL. Headlining the event will be Xola aka Kid Sensation featured in the song “Posses on Broadway” done by Sir Mix Alot. Enjoy local food, retail, arts and crafts, and community vendors throughout the day as well. Progress has continued on the mural at the retaining wall of the 3200 block of East L Street in Tacoma. The wall, once covered in moss and dirt, underwent pressure washing a few weeks back to remove the debris. 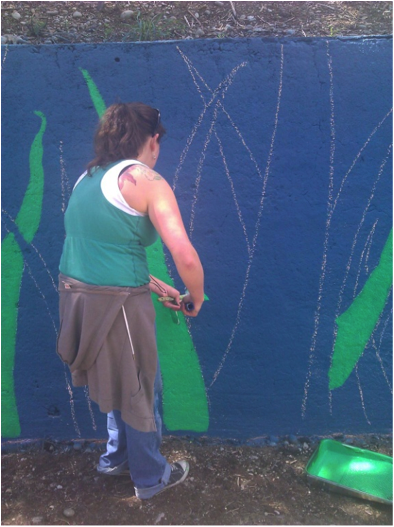 Community members with the Dometop Neighborhood Alliance volunteered time to prime the wall and now the mural painting has begun. The overall design pulls inspiration from the nearby community garden, and will be studded with strawberries and garden creatures. 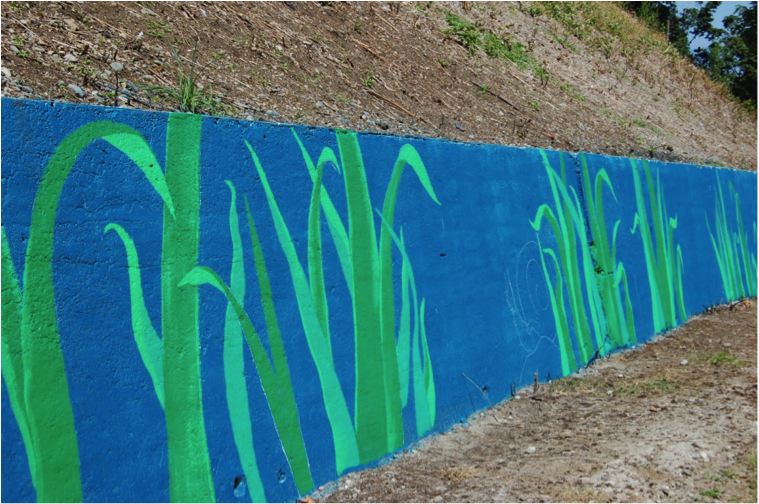 So far, the base of the wall has been painted blue with green grass streaming upward. Lead artists Rachael Dotson and Jeremy Gregory, and artist team Yvette Simone, Chelsea O’Sullivan, and Natalie Oswald are pushing full steam ahead and it should be completed in the next few weeks! 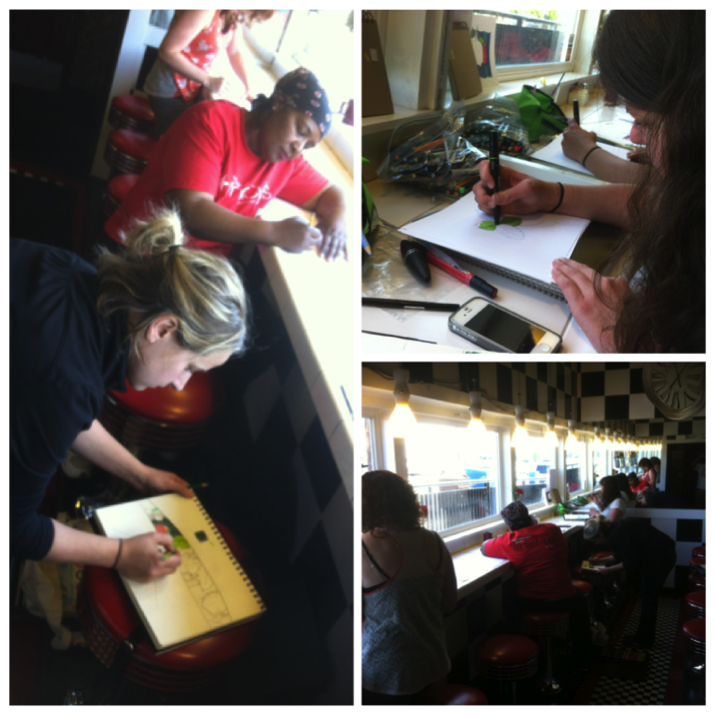 Artist team members meet to sketching the mural design. Photos by Jeremy Gregory. Spraying on the blue base coat. Photos by Jeremy Gregory. Painting grasses. Photo by Rachael Dotson. The mural as of July 12. 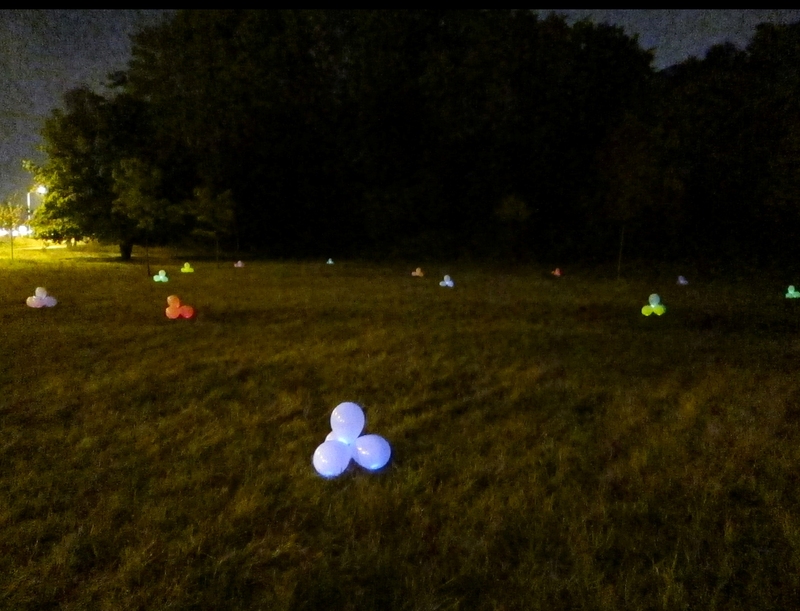 A field of strawberries and some garden creatures will be appearing soon. Photo by Hannah Franke. Tacoma Art Museum Receives Gift of 280 Works of American Western Art from the Haub Family. 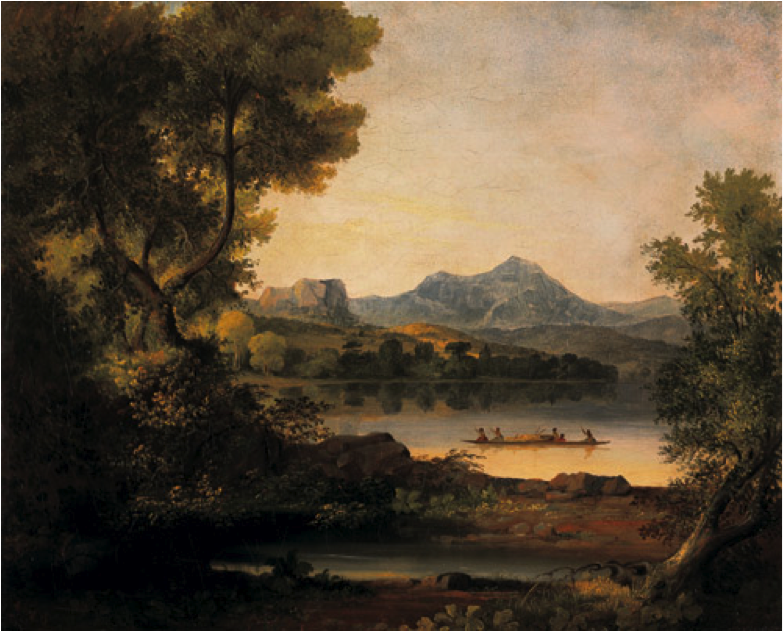 The Tacoma Art Museum recently announced a major donation by Erivan and Helga Haub and family of 280 major works of American Western Art along with a contribution for a new 15,000 square foot gallery and lobby expansion to house the collection, as well as endowment funds for the care of the collection. The new expansion will be designed by award-winning architect, Tom Kundig of Olson Kundig Architects, who is also the architect for the museum’s plaza redesign project. This will be Tom Kundig’s first completed museum project, set to open in spring 2014. 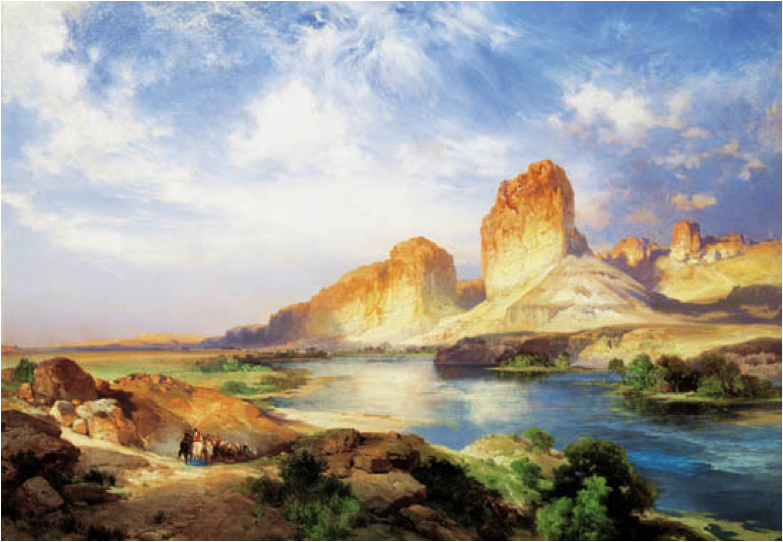 The collection features outstanding works that capture the spirit of the American West including the work of significant historic Western painters, such as grand manner landscape painters Albert Bierstadt and Thomas Moran; titans of Western genre, Frederic Remington and Charles Russell; and works by artists such as E. Martin Hennings and Ernest Blumenschein. The collection also contains works by notable modernist painters, including Georgia O’Keeffe, as well as more contemporary artists such as John Clymer, Tom Lovell, Bill Schenck, and Clyde Aspevig. The works range in date from the 1820s to the present. Claudia Riedener grew up in Switzerland on a small vegetable and dairy farm with a fruit orchard. In 1992 she moved to Chicago, where she received her degree and worked at the Chicago Botanic Garden. After relocating to Tacoma in 1999, she worked in horticulture for a few years before making a career shift to tile artisan in 2002. 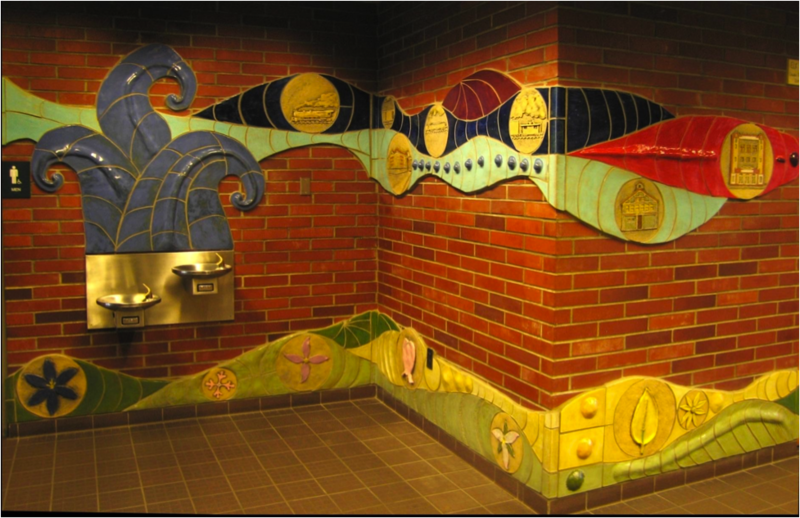 In June, Claudia was selected, through a competitive process, to create a public art piece for Sound Transit’s Art Program (STart) for the 66th Street Underpass. Her goal is to create an mural that depicts past stories of the community while simultaneously transporting them to create new experiences. Sound Transit is expanding its Sounder commuter rail service to South Tacoma and Lakewood. When Sounder service is fully operational to the South Tacoma Station, 18 trains will arrive and depart from the station each day. 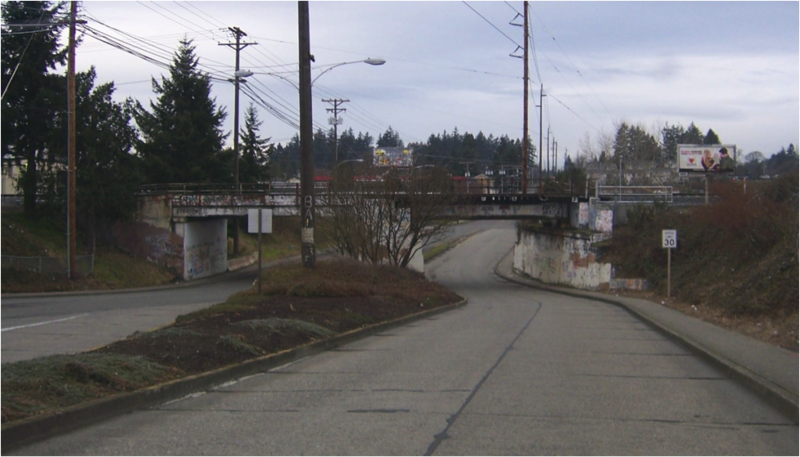 Only six blocks from the new station is the 66th Street Underpass, which creates a natural gateway between the Manitou, Edison, and Arlington neighborhoods and the South Tacoma Way business community to the east. The elevated train trestle has, for decades, served as a tagging ground for surrounding youth and even a site to memorialize area residents. With the work being done to prepare rail service from South Tacoma to Lakewood, Sound Transit is upgrading the rail infrastructure, including this underpass area. Their intention is to make the underpass a welcoming portal to the Manitou community, which is experiencing rejuvenation with the new Boys and Girls Club and Metro Parks’ STAR Community Center. Refurbishing the underpass will consist of removing the lead paint, repairing cracks and concrete spalling, and repainting. After these initial changes are complete, Claudia will create an artwork that will give the underpass a renewed sense of welcome while still maintaining the character of the community that consider 66th Street an important landmark in their lives. I really enjoyed working on the wall mural for the South Tacoma Public Library [project funded through the Tacoma Arts Commission’s Tacoma Artists Initiative Program]. The library board and David Domkoski were a pleasure to work with and the community has welcomed the addition of my work titled ‘Elk Trap’ (picture below). The Zina Peace Park at McCarver has been an amazing experience as well. The students, teachers, Metro Parks Foundation and the neighbors all got involved and created a peaceful, playful and inviting park with much art and great play area and vegetable gardens for both the students and the neighbors. I visit this park often and I like how well it is loved and utilized by the community. What was your initial reaction when you were selected for the 66th Street Underpass project, and what is your reaction to the site you will be working on? Of course I am super elated to be given this opportunity to work with the South Tacoma community again. The entire area has seen such renewal and revitalization; yet the history of the place is still palpable all around. My reaction to the Manitou Trestle involves the underpass being a portal, a way thru to get to the other side, the other place and the return back. The underpass is the perfect canvas. But it also is dauntingly large in area. Do you have any preliminary thoughts about what you will make in the space and how you will incorporate community identity within the space? Before laying out my ideas I want to get community input, meet with the neighborhood council and the business district and do more research. I certainly want to involve applied architectural ceramics; perhaps in combination with other surface techniques. Stay Tuned for updates on Claudia’s project! We’ll be keeping track of other PA:ID artists throughout the year as well. Happy 10th Anniversary, Museum of Glass! Come celebrate the Museum of Glass’ 10th anniversary with two days of festivities including a community party featuring live bands breaking glass and the opening of a new exhibition by maestro Lino Tagliapietra. Museum of Glass opened its doors to the public to wide acclaim on July 6, 2002, welcoming more than 10,000 visitors during its first weekend and nearly 300,000 visitors during the first year, including guests from all 50 states and more than 60 countries. Since then, the Museum has welcomed nearly two million visitors, hosted more than 300 Visiting Artists in the Hot Shop, organized 33 original exhibitions, and built a Permanent Collection of 20th and 21st century glass art. Cost: $10 in advance, $15 at the door. Advance tickets are available for purchase at http://www.museumofglass.org or at the Museum on July 13 prior to 5 p.m. 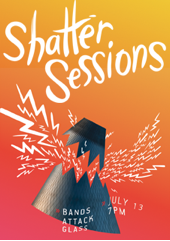 The Museum’s 10th Anniversary celebration will culminate in Shatter Sessions, a concert on the plaza where bands will attempt to shatter wine glasses using only sound. Bands include Friends and Family, Nolan Garrett, Joy Wants Eternity, Hot Bodies in Motion, Miles Max, Rumble Pack, Not from Brooklyn. Choripan by Asado and Social Bar & Grill will serve up a selection of street food and assorted beverages, including a new signature Museum of Glass beer from Engine House No. 9 that has been crafted with input from the Hot Shop Team. Fair-style games, including a “shatter box” form breaking glass, will be available for visitors to play. Meet Maestro Lino Tagliapietra and be among the first to see the exhibition which showcases 65 glass masterpieces created by Tagliapietra during the past decade. The works demonstrate the artist’s evolution to larger works and use of bolder colors and patterns over his nearly fifty year career. Five large-scale installations, featuring butterflies (Borboleta), vessels (Avventura), boats (Endeavor), seagulls (Gabbiani) and shields (Masai) are central to the exhibition. When: July 13, 10 a.m. – 10 p.m.; July 14, 10 a.m. – 5 p.m.
Come to the Museum Store’s annual sale on the plaza. Great savings on select glass pieces and special 10th Anniversary souvenirs from MOG and guest artists Beto Yarce (Cintli), Tisha Abrahamsen (Andre Glass) Paul LaBrie and Tacoma Glassblowing Studio. Artist Keiko will demonstrate the art of flameworking making small sculptures, beads and vessels. Shop early for the best selection! When: July 14, 1 – 4 p.m.
Sail away with Lino and work with artist Jennifer Adams to paint a mini gondola. Transform yourself into a glassblower with our photo panel and watch Fab-5 Break Dancers perform in the Grand Hall at 1 and 3 p.m. When: July 13, 7 p.m.; July 14, 1 and 3 p.m. When: July 13 & 14, 10 a.m. – 5 p.m.; July 15, 12 – 5 p.m.
Davide Salvadore was born into a family of glassmakers in Murano, Italy and is a master of traditional Venetian glass working. He founded and manages his own studio, Campagnol e Salvadore, where he mixes his lampworking and glassmaking skills in inventive ways to create a distinctive and expressive body of work. He is also a founding member of Centro Studio Vetro, a non-profit association founded in 1997 to cultivate and promote the culture and art of glass. When: July 15, 2 p.m. When: July 13, 12 – 5 p.m.
What’s a celebration without party hats? Get creative and decorate a cone head party hat using a variety of colorful and glitzy materials. Personalize a drinking glass with your own custom design. When: July 13, 12 – 4 p.m. Create a unique glass bead with glass rods and a torch. Workshops start on the hour; last session begins at 3 p.m. Suitable for ages 12 to adult. Reservations: 253.284.4719. When: July 14, 11 a.m. – 4 pm; July 15, 1 – 5 p.m. Using colorful glass shards, stringers and frit, create a glass tile that can be used for a coaster OR two glass pendants/magnets. Workshops start on the hour; last session begins at 3 pm Saturday, 4 pm Sunday. Suitable for ages 6 to adult. Reservations: 253.284.4719.